Well, the good news is Diana does give you a sense of what life must have been like for the Princess of Wales in the last two years of her life. In Hirshbiegel’s biopic, we see Diana Spencer living among what looks like some very uncomfortable antique furniture, her childhood teddies cuddled together in her bedroom on a floral-patterned chair that would surely give Billy Bob Thornton nightmares, and we see her often seated before a large vanity, its mirror framed with light bulbs like you would see in an actor’s dressing room, as the princess lines and mascaras those big blue eyes that peered out at us from under the blonde fringe in so many thousands of photographs. For a woman surrounded by the media and attended to by a retinue of palace staff, she seems to have been quite alone most of the time. Aside from her butler Paul Burrell, and a woman, Oonagh (Geraldine James) who appears to have been a mix of masseuse/aromatherapist/confidante and a composite character known as Sonia (Juliet Stevenson), we see little of anyone else in Diana’s life in this film, which sets out to closely examine the relationship Diana had with the Pakistani doctor before her untimely death at age 36. Naomi Watts should be given a lot of credit for having the guts to sign on for this project, and she plays the titular role well enough (down to Diana’s gait, her body language, and her voice) but regardless, throughout much of the film, a voice in my head kept saying “Oh, look, there’s Naomi Watts playing Princess Diana” and that voice almost never went away. I don’t blame Watts or Hirschbiegel for that – I think that dissonance is due in large part to absolute media saturation of images and footage of the Princess of Wales in the ‘90s, which makes it hard to see and accept anyone on screen attempting to re-play that role in those scenes. 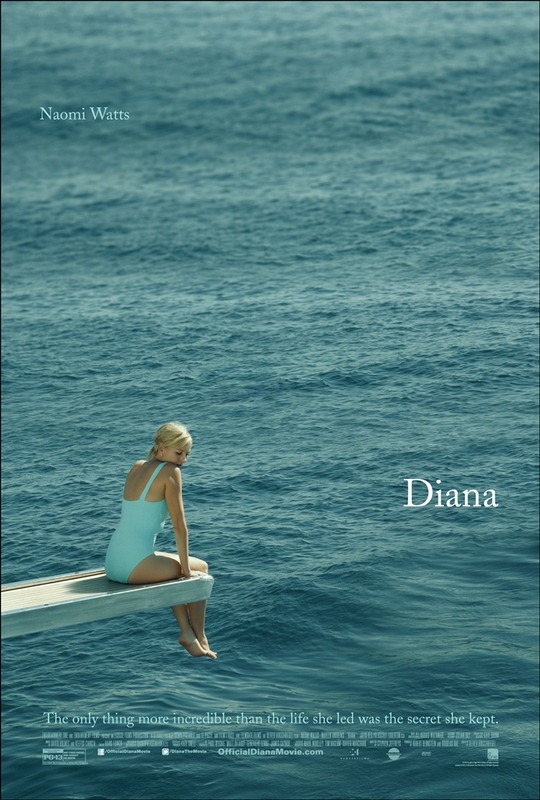 The film was shot in London as well as Croatia, Mozambique and Pakistan, and you do feel as though you are present in those famous, global vignette’s from Diana’s life, but beyond the surface, the rest just feels hollow. For any die-hard fans of the late Diane Spencer, this film may satisfy a hunger to see something, anything about the Princess, since the floor-to-ceiling coverage at the time of her death 16 years ago has abated, but ultimately, it feels like empty calories, like eating cheese puffs while watching TMZ. But for just about everyone else, this film may feel as sappy as a made-for-TV movie you’d see on the Lifetime or Hallmark channels, and not even Naomi Watts or Naveen Andrews can save it. I went in prepared to hate it because the trailer was just so blah — but despite the Hallmark tone of it all (and despite any steamy love scenes! Boo hoo!) I ended up liking it, and even cried at the end! In fact I never was into the whole Diana phenomenon and I still found it quite illuminating.